The Short Version: Since 1984, Drawing Down the Moon, a premium matchmaking company, has paired up tens of thousands of thoughtful singles in the UK. The bespoke match system relies on human intuition, not algorithms, to match up relationship-oriented singles. By arranging hand-picked dates and giving tailored dating advice, Drawing Down the Moon’s award-winning matchmakers guide individuals to make a lasting connection with the right match. The agency’s personable and experience matchmakers take the time to get to know each client and put both thought and know-how into each date recommendation. Known for its award-winning customer service, Drawing Down the Moon offers busy professionals a way to meet compatible, vetted, and quality dates in the London area. One afternoon, a successful, attractive, but painfully shy single man decided to take action to turn his love life around. He was in his late 40s and had never had a steady girlfriend, so he visited the professional matchmakers at the Drawing Down the Moon offices in London to see if they could help him. In his career, the single man was an overachiever with a long list of accomplishments — but, in the dating arena, he struggled to get in a meaningful relationship. Dating on his own wasn’t working, and he hoped the dating coaches and matchmakers at Drawing Down the Moon would make the difference. The matchmaking firm took on the challenge and carefully considered who would be a good fit for the man’s comfort level and dating experience. The matchmakers set him up on a first date with a conservative woman who didn’t mind taking things slowly. It was also her first match. The two clicked on their first and subsequent dates and decided to keep seeing one another. The Drawing Down the Moon team followed up with dating coaching to support the couple in the early stages of the romance. Today, the couple are engaged to be married and couldn’t be happier with the match. 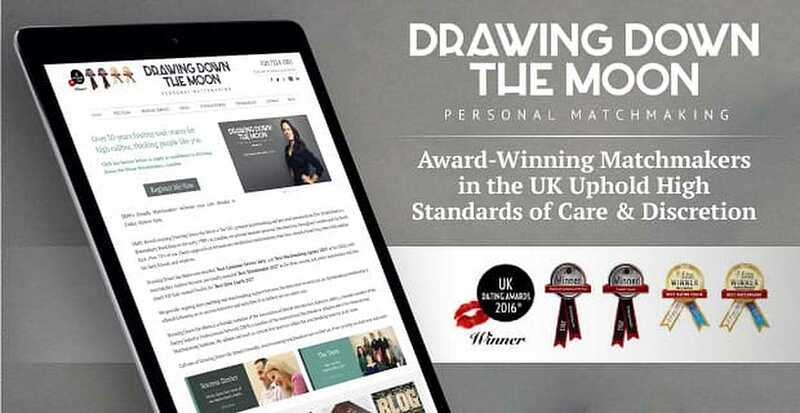 In July of 2016, Gillian McCallum took over as CEO of Drawing Down the Moon, the UK’s longest-running matchmaking agency. Founded in 1984, Drawing Down the Moon began when an inventive woman named Mary came up with the idea of matching up bookish London singles on dates. Mary ran the operation out of the back of a Bloomsbury bookstore and grew her connections organically by focusing on high-quality daters and “thinking people.” It was an effective system. Customers would come for a book and wind up with a date. At the time, no one else in London was running a personalized matchmaking business, so Mary found many daters eager for her services. Her business model grew from there and eventually became a network of more than 2,000 clients across the UK. Today, Gillian runs Drawing Down the Moon with the same care and emotional intelligence that has brought the matchmaking firm so much success over the decades. The capable team has matched tens of thousands of people who are now in happy relationships and marriages. Matchmaking puts singles on the fast track to high-quality dates selected for compatibility. Drawing Down the Moon has spent years honing the matchmaking process to make it as simple and efficient as possible for all clients. All it takes to begin is a phone call, and you can request a callback here. During the introductory call, a skilled matchmaker will assess the client’s background and personality to see if they can be of service. If the matchmakers believe the single is ready to date, they invite the new client to come to the Drawing Down the Moon office in Marylebone. There, clients spend about an hour talking with the team about their likes, dislikes, hopes, and goals, dreams, and passions. The personal matchmaker assigned to the case will ask many questions to get a sense of who the person is and who would be an ideal match for them. That matchmaker has final say in all matches so it’s important they know as much as they can about the person. “Working at Drawing Down the Moon as a matchmaker allows me to play a key part in helping people create the right opportunities to meet that special someone,” wrote Senior Matchmaker and Date Coach Lizzee Fearnly in her bio. Drawing Down the Moon gives hands-on support to clients seeking lifelong love. Serious, relationship-minded daters are well-taken care of at this agency. In 2016, the matchmaking team won the UK Dating Award for Best Customer Service due to their outstanding attentiveness and discretion. From initial consultations to constructive post-date feedback, Drawing Down the Moon’s team brings a personal touch to their dating services. Each date is hand-selected by the matchmakers for optimum compatibility. Membership periods typically range from six months to a year, but Gillian said the team frequently accommodates clients with bespoke packages to meet their needs. The supportive and compassionate team takes care to ensure an all-around good experience for singles every step of the way. Since its founding days in the back of a bookstore, Drawing Down the Moon has established a trustworthy reputation as the premier matchmaking firm in the UK. As word of its successes spreads, more singles seek out the matchmaking team’s assistance, and increasingly from further afield that the UK. Many of those who come to the matchmaking firm do so, by and large, because they know someone who found love through Drawing Down the Moon. Currently, the team boasts a client base of around 1,000 singles and has partnered with dating agencies in New York, Los Angeles and Washington D.C. to further their reach. Recently, the matchmaking firm has seen its clientele shift into two main demographics: younger single men and wealthier professionals, both groups who continue within the “thinking people” parameter. These two groups obviously have widely different needs and priorities, so Gillian and her team have adjusted Drawing Down the Moon’s offering to best serve them both and grow the team’s long list of success stories. Drawing Down the Moon is currently in a hiring period to grow the organization so it can meet the demands of a fast-growing clientele. When interviewing potential matchmakers, Gillian said she looks for generous, kind and approachable individuals with good listening skills. The agency’s most successful matchmakers have come from diverse backgrounds in PR, therapy, headhunting, and publishing, but all possess an innate ability to understand people and maintain high standards of customer care. In the coming years, Gillian is keen on expanding Drawing Down the Moon while staying true to its roots of personalized matchmaking. “We want to continue giving the same high level of service and personal, approachable care as we have done since 1984,” she told us. After a year, Daniel got down on one knee. They’re now married and have started a family. Daniel and Lisa both agree that they never would have met without Drawing Down the Moon introducing them. Over the decades, the team has received quite a few wedding invitations from former clients, and it’s always a gratifying feeling to know their work makes such an instrumental difference in people’s lives. People turn to matchmakers for a variety of reasons. Some singles are too busy to play the field on their own. Some singles lack experience in the dating arena and want a little guidance. Some singles just want to try something different to make finding a compatible date that much easier. If you’re seeking to make a real connection with someone, Drawing Down the Moon’s matchmaking team can help you sort through date prospects in the UK and meet your match. Drawing Down the Moon has more than 30 years of experience matching thoughtful men and women on quality dates. Thousands of daters have found themselves in committed relationships thanks to the attentive care of this premium matchmaking team. Taking a personal interest in their clients, Drawing Down the Moon’s matchmakers specialize in making wise dating recommendations that direct singles to that one true love. The human element of dating is never forgotten in these London offices. Whatever your dating history or experience levels, the matchmakers skillfully usher singles from first date to falling in love.